See also Jetstream by afrojet. 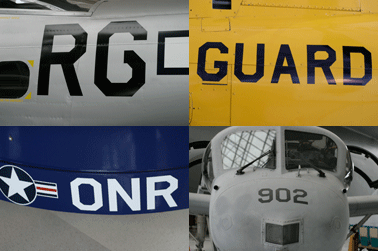 Loosely based on several styles of letter and numeral forms observed on various aircrafts at the Evergreen Aviation & Space Museum in McMinnville, Oregon. The museum is home of Howard Hughes Flying Boat H-4 Hercules (aka, the Spruce Goose). Info: Created on 4th January 2009 . Last edited on 16th June 2009. This is a knockout, afrojet! Thanks guys. I'll work up a non-perf'd version as well, but I think it will have some significant differences to this font: raised x-height, thinner horizontals in the uppercase, etc,. I'm probably going to be singing that INXS song in my head all day now. As for font...it's just superb. The shapes are well executed and the perforations well place. The Y is just the perfection in perf placement efficiency. Some examples from the museum. Simply crafty! You seem to be so aware of the surroundings that inspire you.